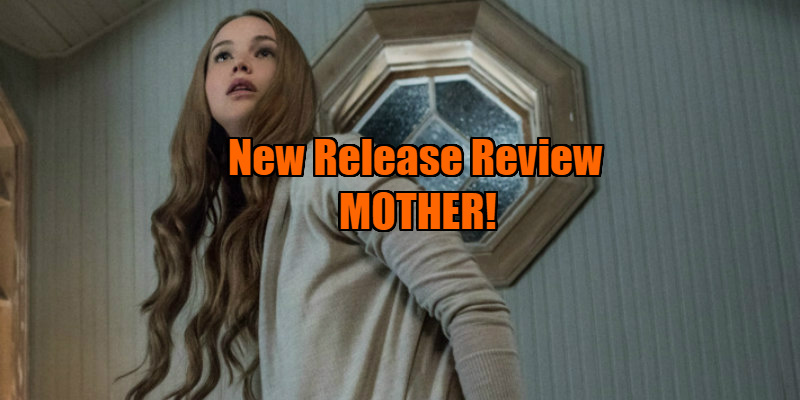 New Release Review - MOTHER! An expectant mother is hounded by a series of unwanted houseguests. Prior to Noah, the only Darren Aronofsky movie I found myself remotely able to connect with was The Wrestler. That Mickey Rourke vehicle is an outlier in his career, a straightforward character drama that stands in stark contrast to his pop-surrealist cult hits like the insufferably intellectual Pi, the tedious Requiem for a Dream (whose ultimate legacy has been providing a soundtrack for every football commercial) and the unbearable Black Swan (a movie that boasts what may be the worst ever Oscar winning performance). The trouble with Aronofsky is that he's somehow convinced himself that he's Dario Argento when he's really Hal Ashby. He wants us to think of him as one of those 'mad' filmmakers like Jodorowsky, Lynch or Bunuel, but he's far too sane, and his movies are clearly made by someone who wipes his chair before he takes a seat. Noah owed much to the filmography of Peter Weir, pulling elements from The Last Wave, Picnic at Hanging Rock, The Mosquito Coast and Fearless, and Aronofsky continues his love affair with the Kiwi auteur with mother! (sic; yes, it's that sort of film), which essentially is Weir's genius 1979 TV movie The Plumber remade for ADHD sufferers. In Weir's film, an anthropologist finds herself incapable of getting a psychotic plumber to leave her house. It's a masterpiece of absurdist comedy, one which grows increasingly tense and sinister, and has a lot to say about the discomfort of interactions with strangers and the inherent fear women experience in the presence of men. 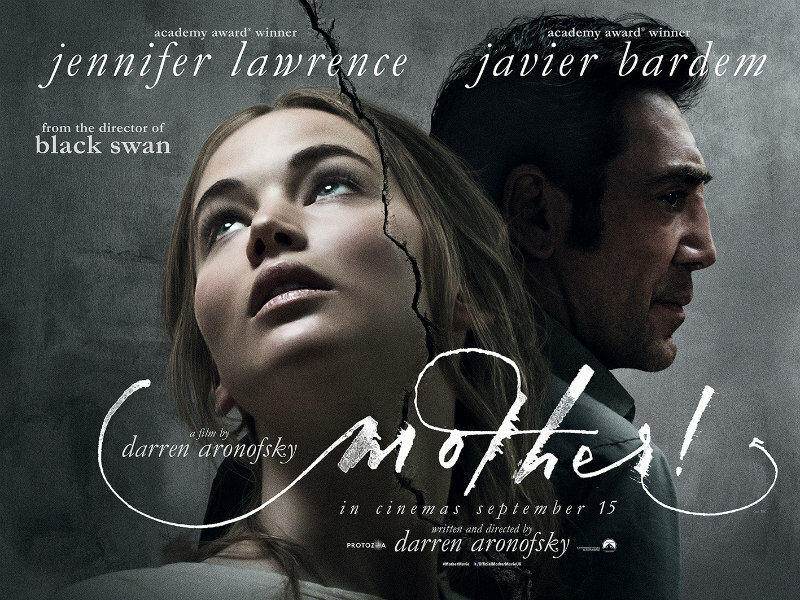 With mother!, Aronofsky takes all these themes and bludgeons us in the face with them for an overbearing two hours. The experience is akin to lying under a cow as a butcher slits its stomach open, showering you in offal and gore. Jennifer Lawrence plays an unnamed woman (yes, it's that sort of film) who lives in a remote, secluded house, of the sort Edward Hopper might have painted, with her unnamed (aargh) husband (Javier Bardem), a poet who's struggled to write a word in recent years. One evening, an unnamed stranger (Ed Harris) arrives, and that's about as far as I can go in detailing the premise without being chased by an angry mob of torch wielding spoiler Nazis. Suffice to say the situation grows increasingly absurd until it reaches apocalyptic levels in the final act (think 8½ meets Children of Men). It's a Monty Python sketch stretched out to two hours, or a Eugene Ionesco play with too many actors. If you can tolerate it, good for you, but halfway through I began wishing cinema auditoriums came equipped with ejector seats. Don't get me wrong, I love absurdism and surrealism, but only when rendered in a genuine fashion. Aronofsky's attempts at such genres feel incredibly contrived, and once you read how he wrote the script for mother! over a long weekend during a bout of writer's block, it all makes sense. mother! is in UK/ROI cinemas now.